Today’s comic features avid gamer, generous guy, and all round good sport Jonathan Er. Last year on Board Game Geek, in aid of the Jack Vasel Memorial Fund, we auctioned off an appearance in one of our comics, and Jonathan was the highest bidder, raising far more for the fund than we thought, which was just fantastic. So, if anyone is wondering what $209 will get you in today’s economy, the answer is ‘eaten by a bear’. So thanks again to Jonathan, and you all should check out his podcast. Although it doesn’t feature any bears, it is about board games. And if you’re here you probably like board games. Unless you are here because your Google image search for bears has gone very wrong. In which case I can only but apologise. 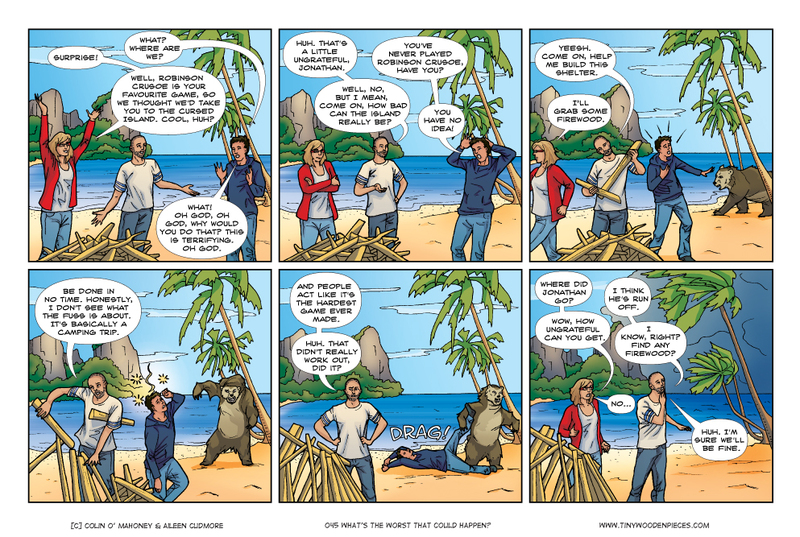 It’s true we haven’t ever played Robinson Crusoe. We both love co-op games, and are big fans of islands (who doesn’t love an island! ), so this should be right up our alley. But after a long time researching reviews (good and bad) we’re not yet sure the game is for us. The high difficulty it offers is definitely a positive. Co-op games are best when they challenge the players, and force them to work together. It’s no fun if the players can win without discussion, use of player abilities and teamwork. A game that lacks these elements takes the “co” out of “co-op”. And that’s a silly sentence so let’s move on to the next paragraph. Reviews of Robinson Crusoe seem quite divisive. That in and of itself is no bad thing, a game that provokes strong reactions is a good thing. If people feel really strongly about something, it’s immediately more interesting, but I think what is required is that we play the game ourselves to see where we stand with it. In the meantime, it would be remiss not to mention Exploding Kittens. As I write, the final hours of this phenomenal Kickstarter campaign are counting down. I have it open in another tab, watching in real time as more than 30 people a minute decide to buy a card game. I have no idea how many of these people are already gamers, and for how many people this will be a gateway to a new world. A gateway that opens up into this hobby that you and I already love so much, and want to share (I’m presuming that if you’re still here it really is for board games, not bears). A good guess says that a large percentage of the backers are not regular gamers, coming through Matthew Inman’s amazing webcomic, or just the novelty of an exploding kitten, and that is fantastic. The wider the gateway to our hobby is, the better. And eight and half million dollars says that gate has never been open wider. 7 Comments on What’s the worst that could happen? A couple of friends of mine backed this, so I’m happy to be able to get to play someone else’s copy. As with you, I don’t expect to be overwhelmed by the game play, but it sure does look like fun for a few games. I’m also saving my Kickstarter money for Thunderbirds. With Matt Leacock at the helm I’m pretty confident about gameplay, but right now I’m dubious about the Kickstarter. Can’t shake the feeling that it will feature things like ‘deluxe editions’ and ‘add-ons’ for more models, etc. It’s launching next week though, so I’ll find out soon. Just about to watch the playthrough now, have had it open in a browser tab all week waiting for a chance. What did you make of the gameplay? I wasn’t watching overly carefully, so these are vague first impressions more than anything else. There are similarities to Pandemic, but the mission track idea I thought looked quite clever – a way of giving the idea of impending, but manageable, doom. I’m interested in how the balance works – it did seem a little like you could get somewhat screwed if you didn’t have a crew member who was a specialist in the types of missions that you draw (although this did happen to them with space missions, and they still won…. Their Kickstarter page has a Rahdo runthrough on it, which I found a little more useful in assessing the game. Essentially it looks like Pandemic, except that rather merely handing out the cards for set collection to cure viruses, you’re completing missions by rolling dice, and using an almost worker-placement mechanic to mitigate the results of the dice. Completed missions give you the cards to defeat the Hood, but those cards can also be used for other advantages (rerolls, +N to dice rolls, etc). FAB cards operate like the special cards in Pandemic. I am really interested in this now – it seems to combine a lot of what I like from Pandemic, with the “Quest” side of something like Lords of Waterdeep (which I love), and a bit of dice rolling. I wonder if I can persuade my wife to let me back the Kickstarter for my birthday present….. I did end up buying Robinson Crusoe and have not regretted it for a second. I have only had time to play it 3 or 4 times so far, but I have thoroughly enjoyed every game. It is an expensive game though, so if you are able to play it before you buy it that should help you make your decision about whether it would work for you.